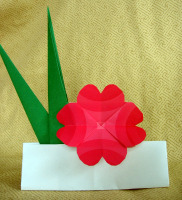 The model for the four-heart flower is the same as the single one, just cut differently. By varying the sizes of each, and using different papers, the possibilities are endless. 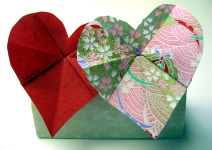 We used origami paper, color copy paper, and scrapbook paper with a heart pattern. We sprayed the red hearts with red glitter. 1. Make the display stand and the other model(s). 2. Disassemble the display stand and flatten it. 3. So that the recipient will know how to reassemble it, mark the tabs and slots as indicated in the folding instructions. Print the assembly instructions for them. 4. Put the recipient’s address on a sturdy envelope. 5. Put the flattened stand, the other model(s), and instructions in the envelope and mail. You may need extra postage.